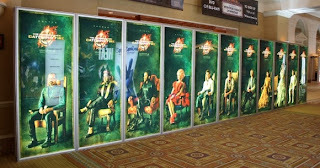 Home » » New Catching Fire footage debuting at CinemaCon today? New Catching Fire footage debuting at CinemaCon today? Elizabeth Banks just tweeted an update saying that she is in Las Vegas for the CinemaCon convention today. As well as receiving her "Excellence In Acting" award, she will be talking about Catching Fire! There was a rumour circulating recently about Catching Fire footage being shown at CinemaCon today (perhaps with an appearance from Sam Claflin), and after this tweet from Elizabeth, it certainly looks very promising. For those of you who don't know, CinemaCon is a movie convention held in Las Vegas every year for movie theatre owners and distributors. It is very common for movie studios to exhibit exclusive new footage from their upcoming movies to the crowd. Sony showed their first look at the new David O Russell movie "American Hustle" featuring Jennifer Lawrence at the convention yesterday. And now it's Lionsgate's turn!